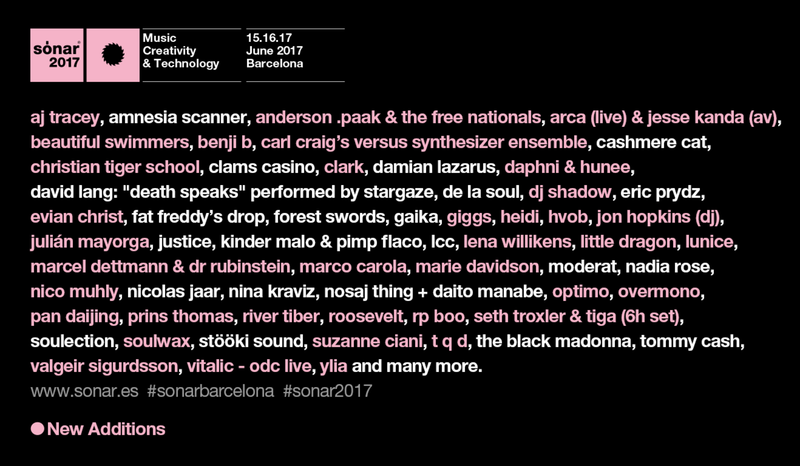 On the 15th – 17th June Point Blank are returning to Sonar+D, an element of Barcelona’s premier festival Sonar, to present two masterclasses. This is the second year we have taken part in the festival, following successful Point Blank sessions last year from course developer Ski Oakenfull and DJ/Producer Richie Hawtin. Sonar+D aims to bring together creativity and technology, with 4,500 professionals, 2,000 participating companies and 30 selected partners from across the globe presenting over the 3 days. Point Blank will be programming masterclasses for the second consecutive year as part of this event. This year, Ski will be hosting a live track deconstruction of DJ Shadow’s ‘Mutual Slump’, off his seminal album ‘Endtroducing’. With DJ Shadow performing at Sonar this year, the distinctive track is all the more relevant. Throughout the masterclass, Ski will be using Ableton and Push 2 to demonstrate sampling, production and mixing techniques. This is just a small snippet of what you could learn on our comprehensive BA (Hons) Music Production & Sound Engineering Degree. On the 16th, Point Blank & Native Instruments will be hosting Hot Chip’s Joe Goddard for an exclusive masterclass. Hosted by our own Carly Hordern, Goddard will share his studio tips and tricks and will provide insights into electronic music songwriting, discussing his outlook towards creative workflow, production, and overall track arrangement. This year’s festival will see the likes of The Black Madonna, Nicolas Jaar, Jon Hopkins and many more take to the stage. To secure your tickets, click here. What we present in our masterclasses is just a snippet of what you can learn at Point Blank. If you want to learn recording, engineering and mixing techniques as well as dive into DJing and even master the music business, our online BA (Hons) Music Production & Sound Engineering Degree and online Diploma Courses cover all this and more. Taken from anywhere in the world they’re some of our most comprehensive programmes. Graduates include Patrick Topping, Jon Rundell and No Artificial Colours so you know you’re in good hands. You can also try a free online sample course here. The post Point Blank are Presenting Masterclasses at Sonar+D 2017 appeared first on Point Blank’s Online Magazine.